Down Rio Grande, entertain LWC on Thursday. Ginger Colvin thought she might need to call the Rio Grande (Ohio) EMS on Saturday afternoon to see if her team had a heartbeat. And it wasn’t a false alarm. The Lady Tigers chucked the resuscitator, though, and extended their Mid-South win streak to 10, and a sparkling 25-1 overall record, with a 79-67 victory over the Red Storm. Whitney Ballinger had a triple-double (29 points, 13 rebounds and 10 blocked shots) during the Lady Tigers' road triumph vs. Rio Grande. CU trailed most of the first half, controlling only two leads, 7-6 and 30-29 with 35 seconds to go. But that was short lived after Bre Davis canned a jumper, and Rio was one better after 20 minutes, 31-30. The Lady Red Storm was cleaning Campbellsville’s plow on the boards, leading that statistical category at intermission 26-15, 19 on the defensive end. After hitting only 20 percent from the arc in half one, the Lady Tigers got a 3-point transfusion at the start of the second half as Wendy Messer cashed in twice (four times in all). A Courtney Danis runner gave CU a 38-31 lead with only a minute gone and the Red Storm could get no closer than four after that. Rio was 5-4 MSC, 14-11 overall coming into the game. But four of their five MSC wins were on their home court, as well as eight of their 14 overall victories. It was obvious the Red Storm liked their home hardwood. Ballinger led the Lady Tigers with 29 points, 13 rebounds and 10 blocked shots for what’s believed to be the first triple-double in Lady Tiger history. Messer kicked in with 18 points, 15 in the second half. 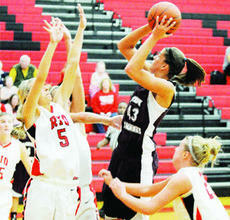 The Lady Tigers were 24 of 63 from the field for 38 percent and 38 percent from behind the arc on 8-of-21 shooting. Rio continued to win the rebound battle in the second half and ended that game with a four-board margin (41-37). CU returns home Thursday for a battle with nemesis Lindsey Wilson before going back on the road Saturday at St. Catharine.